Are you ready for Valentine's Day? To kids, this is the most exciting day of the new year. My students enjoyed delivering every card to their classmates and then reading every single message. And of course, the candy the kids included with the the card was enjoyed even more. Why not get the kids involved in making the treat for the class party. 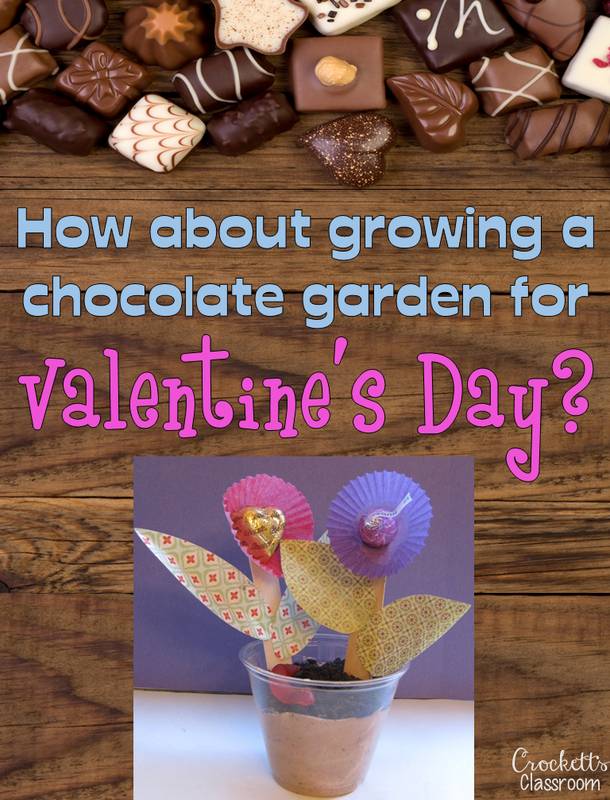 Here's a recipe for a super easy chocolate treat you can make in the morning and it will be ready for an afternoon class party. Candy bugs and chocolate drop flowers. 1. Pour the pudding mix and milk into a large bowl. beat with a whisk for 2 minutes. 2. Let it stand for 5 minutes. 3. Stir in the whipped topping and 1/2 cup of cookie crumbs. 4. Spoon into plastic cups and top with remaining cookie crumbs. 5. Put in the refrigerator for 1 hour. 6. Top with candy bugs or worms and chocolate drop flowers. 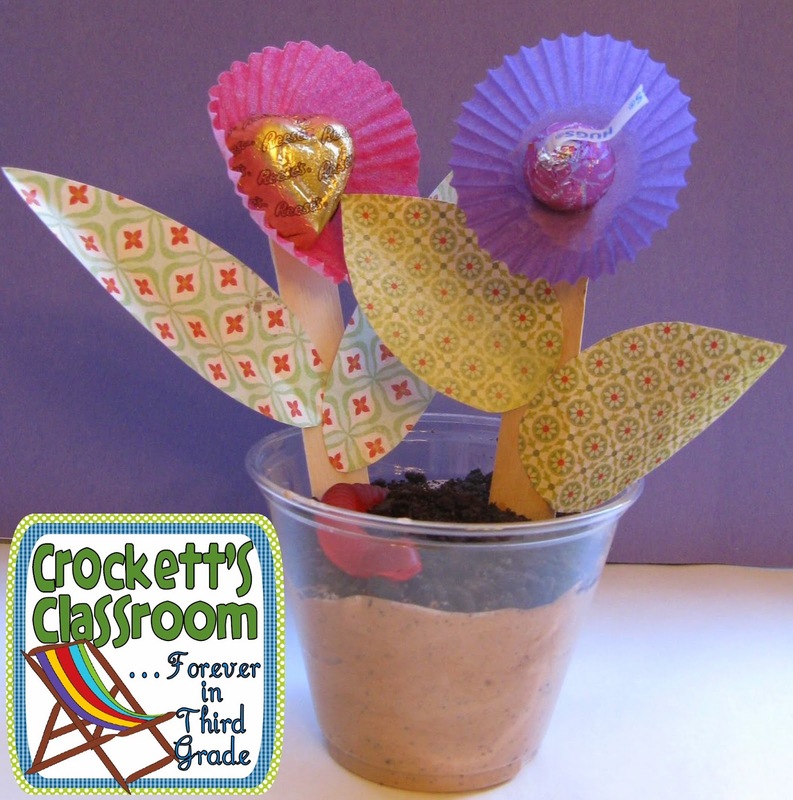 While the dirt cups are in the refrigerator students can make the candy drop flowers. 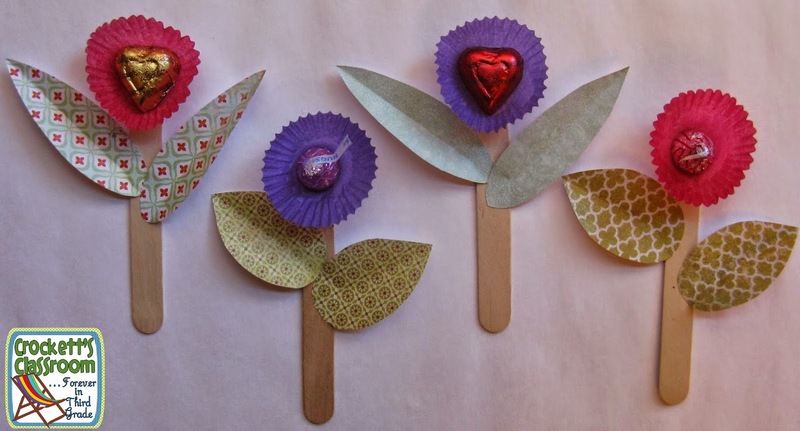 Mini cupcake papers, small individually wrapped chocolates, wooden stick, green paper and glue are all you need to create these flowers to plant in your garden. Any chocolate lovers out there? You'll fall in love with my unit- Three Cheers for Chocolate! 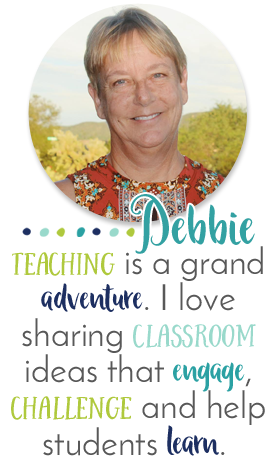 It's packed with so many great learning activities your students will love. 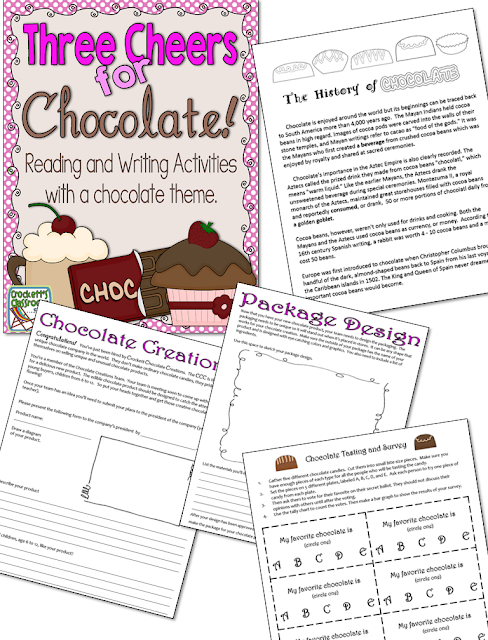 Students read a 2 page informational text about the history of chocolate. There's also a short quiz. Teams of students work together to create a new product for the Crockett's Chocolate Creations Company. The teams have to create a product, design the packaging and draw a magazine ad. A scoring guide is included to guide students through every step of the process. Just for fun you can have students bring in several different types of chocolate candy and then have a tasting. Students will conduct a survey to see which chocolate is the class favorite. 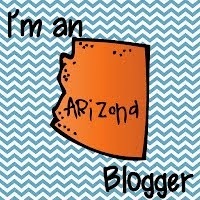 Great way to incorporate data collecting and graphing skills. Share the picture book Cocoa Ice. It's a delightful and informative book about chocolate. Students will learn how chocolate goes from the tree to delicious hot chocolate. The second half of the book explains how ice was harvested from frozen rivers in Maine and shipped to far away tropical islands. A discussion guide is included along with a little Note Keeper for students. Then there's a sequencing activity for students for both parts of the book. The unit also has three writing prompts/graphic organizers. Finally, the directions for the chocolate pudding cups and chocolate drop flowers in included.